The creation of certain constructs was necessary for our two systems for cell selection by means of apoptosis: “Cut’N’Survive” and “Jump-Or-Die”. We searched for sources of the DNA sequences we needed and found several supporters which are listed below. Most genes and promoters were amplificated via PCR with overhang-primers with the BioBrick prefix or suffix. If the sequence contained a EcoR1-, Pst1-, Xba1-, Spe1- or Not1- restriction site, we used mutagenesis primers and fusioned both DNA parts by fusion PCR. All PCRs worked out, even the fusion PCRs. 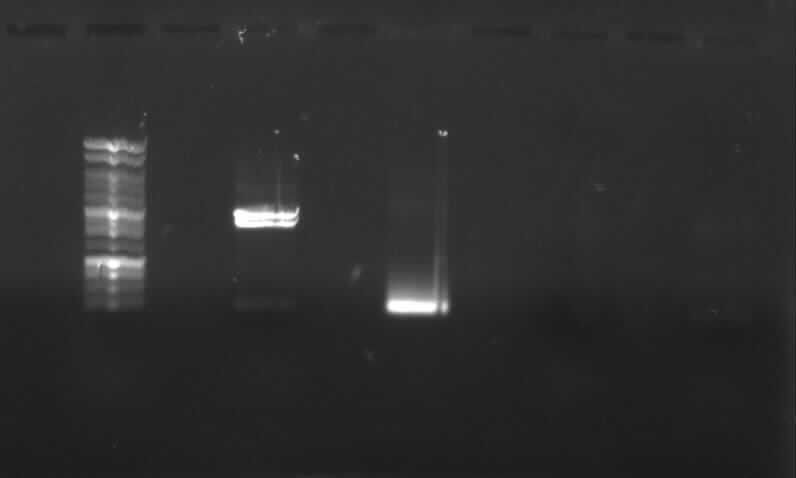 The length of the PCR products were tested by agarose gel electrophoresis. We tried to sequence our PCR products, but obtained poor results and resorted to sequencing the plasmids. In parallel, we made competent cells and multiplied ccdB (death gene)-vectors with different antibiotic resistances. All components were digested with the appropriate restriction enzymes. The samples were cleaned with a PCR clean up kit or dephosphorylated to reduce false ligations. We ligated our constructs and several interim stages with the 3A-assembly according to our schedule. The ligations were transformed to E.coli DH5α strains and selected by antibiotics. 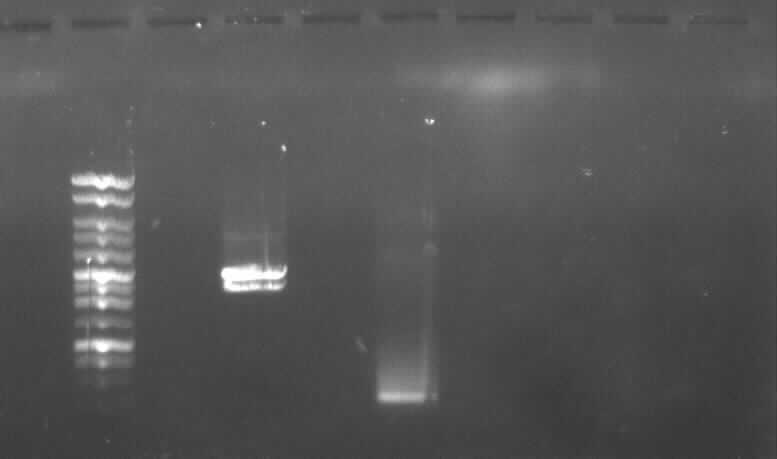 Afterwards, some colonies were picked and we tested the insertion of the construct by colony PCR. If the colony PCR resulted in bands of the right size, we extracted the plasmids from overnight cultures and sequenced the samples with forward and reverse BioBrick primers. Unfortunately, not all BioBricks were cloned succesfully. However, we were able to produce 4 BioBricks, one of which represents a full construct while the other three are intermediates. The system wasn't completed on time, so we weren´t able to test them in eukarytic cell lines. 10x Buffer Pfu 5µl "
Pfu Polymerase (3u/µl) 0,5µl "
Plasmid extractionof 3 different overnight cultures. - plate ccdB with ampicilline, chloramphenicol, tetracycline resistance on LB agar with appropiate antibiotic. gradient PCR, 42-69°C annealing temp. Inoculate one colony each in 5ml medium with approptraite antibiotic. Standard PCR program with annealing temperature PCR4a: 51.1°C, PCR4b: 48.5°C. from left to right: ladder, 4 columns pathway, 4a gelextr., 4b gelextr. -> results: slight right bands for 4a and 4b, no "primer clouds" anymore. Ligation at 22,5°C for 30 min, denaturation at 65°C for 10 min. The incubation time for the cells is here 1 hour. Eluated with H2O instead of the Eluation Buffer. PCR3, 9, 10 with right bands. -> Protocol Touch down 59 with phusion, 30 cycles with gradient appropriate for the annealing temperatures above. Only 4a has been amplified successfully. -> new PCR 7a and "8"
number 7a 7a "8" "8"
new PCR 7a & "8"
7a-1,7a-2,"8"-1,"8"-2: primerdimer-problem -> we ordered new primers! Add 1µl TSAP to digested vectors. charges 7ak and 7al had not been labeled, so they were renamed. The pSB1C3 colony was pink (produced a red pigment or something like that, so we make a new transformation in order to extract only pSB1C3 and not some other vectors. New transformation of pSB1C3 from Spring distribution because the old colony was pink. Transformation of BB1 and BB6. from left to right: ladder, BB5/50µl, BB5/20µl, BB11/20µl. BB5/50µl and BB11/20µl show the right band.